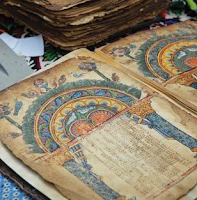 The Garima Gospels were disastrously conserved in 1963 by a local binder. The work was done so badly that nearly every time the two volumes were opened, pieces of parchment would break off. The contents were bound haphazardly, with many of the pages out of sequence or even in the wrong volume. In Garima II, another 14th century Gospels was included, adding to the weight and thickness (around 20cm) and making it even more fragile. Little was done to protect the illuminated pages, which were the most damaged since they tended to be those inspected by pilgrims and visitors. New folds in the parchment were introduced over the images. Missing sections of parchment were replaced with sewn patches and strips, creating further problems. 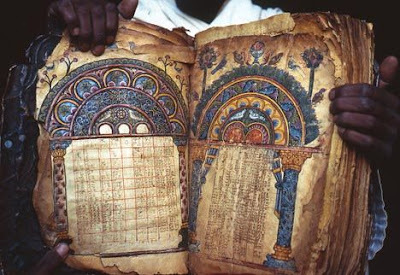 Encouraged by Jacques Mercier, the London-based Ethiopian Heritage Foundation concluded that proper conservation as an urgent priority, and in 2006 a team from Europe made the arduous journey to Abba Garima: manuscript conservator Lester Capon, bookbinder Mark Winstanley and scholar Mercier. 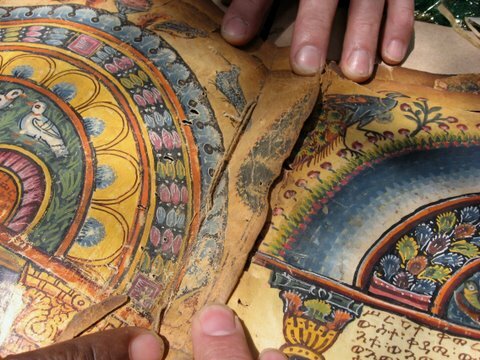 The work was approved by Ethiopian patriarch Abba Paulos and the monastery’s Abbot Teckla Maryan. Conditions were extremely difficult, and work was done outdoors in the monastic compound. The conservators had to move three times a day, to keep out of direct sunlight. Along with the wind, they also had to frighten away long-tailed monkeys and buzzards. With only just over a week at the monastery, the team only had time to conserve the illuminated pages using Japanese paper (a reversible technique). They rebound the manuscripts in a way that would minimise further damage when opening them. The intervention was minimal, and Capon found extensive amounts of debris—dust, leaves and dead insects—in the back folds throughout the two volumes. “These were left in situ, partly as evidence for some possible future study and also because the removal would probably loosen the sewing,” he explained. There was no time to tackle conservation of the text pages—this will have to be left to a future campaign.